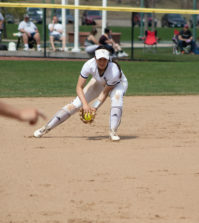 Determination takes true form in Carly Timpson, who has been overcoming hurdles her entire life. Walking through the halls at Quinnipiac, most people can hear the sounds of music, phones and people buzzing. Timpson cannot. She was born deaf and is unable to hear the little things around us without extreme focus and the addition of hearing aids. It may seem that Timpson has been at a disadvantage compared to her peers, but she never let her hearing weigh her down, according to her stepmother, Janet Timpson. Aside from her studies as a junior english and secondary education major, Timpson writes poetry for Montage and is on Quinnipiac’s track and field team. Those who know Timpson would describe her as having a bubbly personality, while also being an inspirational leader. 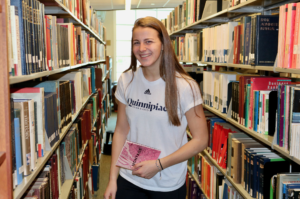 Timpson’s roommate, and fellow member of the track and field team Kaitlyn Herbert, notes Timpson’s contagious compassion and positive attitude that help boost team spirit. 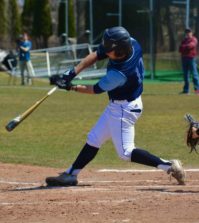 Many student-athletes find it difficult to juggle personal challenges while maintaining an adequate performance both academically and athletically, and Timpson is no exception. With the support of her team and classmates, Timpson has been able to overcome every challenge that has attempted to obstruct her resilience. Personal battles such as managing feelings of distress have become easier for Timpson since she joined the team because it creates a sense of stability and control in her mind. Timpson cares not only for her teammates, but for those who hear her poetry. She wants to help others feel secure in knowing that they are not the only ones experiencing hardships. The ever-evolving themes in her writing derive from her own personal struggles, which help promote radical acceptance and understanding of mental illness. She strives to create a relatable and sensitive approach to the ideas of depression and anxiety that so many college students deal with. According to a survey produced by Boston University, approximately 13.8 percent of students reported that depression affected their academics while 21.9 percent of students reported that anxiety affected their performances in school. “We think we’ve lost our minds, but of course we haven’t. They surface as bruises left behind by the secrets we share, and the thoughts no one else would understand,” Timpson wrote. Timpson wasn’t always comfortable talking about depression. 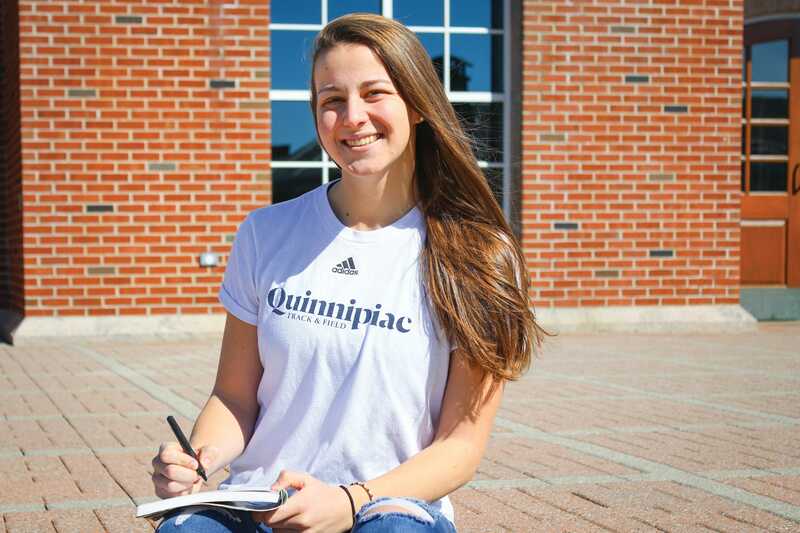 Montage, Quinnipiac’s student-run literary magazine, publishes students’ works and holds open mic nights throughout the year. Timpson had gained the comfort and confidence to be able to share her writing with members of this creative community. Student-athletes must manage their time based off of a set schedule of practice and competitions which can potentially impact their ability to thrive academically, according to Timpson. After finding ways to translate the skills she gained in handling her own personal struggles, Timpson was able to apply those skills to her athletics and other aspects of her life. Timpson has accomplished much as a college athlete while juggling many other responsibilities. 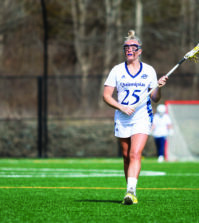 During the Metro Atlantic Athletic Conference (MAAC) Championship, Timpson faced an overwhelming amount of pressure from those hoping for her to win. Despite an overwhelming amount of pressure, her performances in both indoor and outdoor track paid off. Timpson placed first in weight throwing for indoor as well as first in both weight throwing and high jumping in outdoor track during her freshman year. 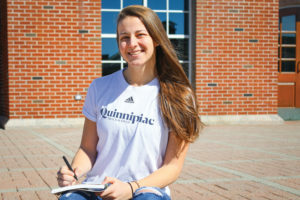 During the MAAC Championship in Timpson’s sophomore year, she earned first place in both the weight throw and high jump events in outdoor track. Her winning streak continued into junior year for indoor track with the high jump event. “She is motivated with her sports events, always wanting to jump higher and throw farther,” Timpson said of her step-daughter. Timpson has accomplished prodigious and amazing feats as an athlete despite being born with the inability to hear. Her proudest moment was when she competed in the 2017 Deaflympics in Turkey. Her two main events were throwing the hammer and high jumping for the track team. She won the silver medal in the high jump event. In order to compete in the Deaflympics, Timpson said she had to prove that she couldn’t hear at all. She had to remove her hearing aids to perform a multitude of tests to prove her disability. Through this experience, Timpson was able to prove to herself that she could still be successful without hearing aids. Timpson’s parents placed her in speech therapy when she was 3 years old with the addition of hearing aids to prevent any difficulties she might have developed had she been raised in any other way. Timpson’s extraordinary sense of determination to learn to speak and understand those that communicate with her are confirmed by her stepmother and audiologist’s observations. Through being raised in a supportive environment, Timpson felt secure in giving up the state-provided aids in order to provide her with a challenge. This required her to pay more attention to her surroundings and not use aids. “It isn’t reality to rely on something or someone to help me to succeed,” Timpson said. Timpson teaches us that our limitations are only defined by the power we give to them. As an undeniable role model, she refused to allow any personal struggles interfere with her success. “Try not to let anything limit you,” Timpson stated.